Three men have been found guilty of killing a rival drug dealer in a gang-related revenge attack. 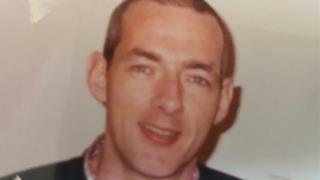 Mark Mason, 48, of Rhyl, Denbighshire, was stabbed to death in the car park of the town's Home Bargains on 27 October. James Davies, 20, was convicted of murder, and Anthony Baines, 30, and Mark Ennis, 30 were convicted of manslaughter at Mold Crown Court. Jake Melia, 21, previously admitted the charges and the four will be sentenced in June. Davies, Baines and Ennis, all from Liverpool, denied murdering Mr Mason. They also denied maliciously wounding Justin Trickett and Sam Illidge - who were in the same vehicle as Mr Mason - with intent to inflict grievous bodily harm. Mr Trickett and Mr Illidge were also stabbed in the attack, but their wounds were less severe. Baines was found guilty of one count of wounding, but Davies and Ennis were cleared of those charges. Mrs Justice Nicola Davies remanded all three in custody until sentencing, which she said would take place over three days. The trial heard the attack was the result of a turf war which had erupted between two rival gangs over the control of the drugs trade in Rhyl. Paul Lewis QC, prosecuting, told the trial Mr Mason, a father of two, was "repeatedly and fatally stabbed" by the three defendants and Melia as he sat in the passenger seat of a van in the car park. He was stabbed 22 times in less than a minute. The four killers were members of the "Pensarn Crew", sometimes called "Ste's Crew", Mr Lewis said. Mr Mason, Mr Trickett and Mr Illidge were members of "Mark's Crew", or "Marco's Crew" - although it was not suggested Mr Mason was the leader. "The fatal attack appears to have been an act of retribution on the part of the defendants and Melia," said Mr Lewis. Jurors were shown CCTV footage of a white Renault van near The Cob area of Rhyl on the afternoon of 27 October which showed the white van being stopped by a black BMW 4X4. Shouts of "stab him" and "kill him" could be heard. The prosecution said the killing was retribution for an earlier incident when Melia and Davies were said to have been chased by masked armed men while drug dealing in the area.